I have a cave that is ravine like and stretches approximately one kilometer down into the Earth. 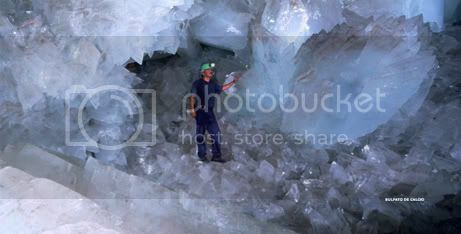 Let's assume that the cave has a clear, crystalline roof allowing some light in. Is there any sort of crystal, mineral, substance, or something else naturally occurring that could reflect light into most parts of the cave? I want the cave to have enough available light for average plants and such to grow with the upper half of the ravine. 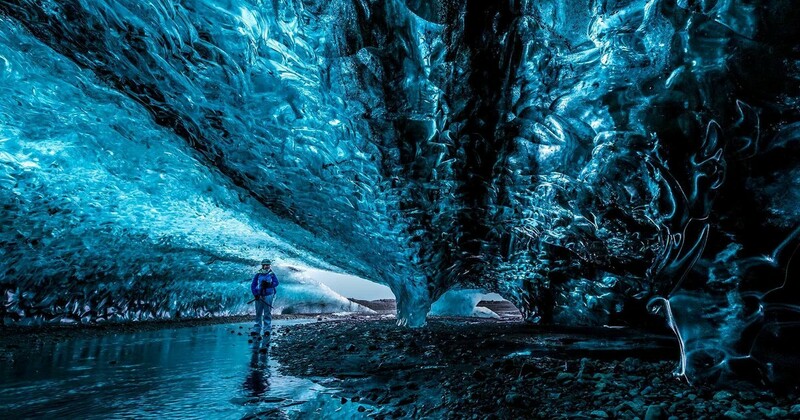 The Icelandic ice caves (in glaciers) are made of translucent ice which admits sunlight from above. The light bounces around, refracting within the ice, reflecting off of other ice surfaces within the cave and illuminating the interior to a degree you would never see in a regular stone cave. Unfortunately there is limited chance that enough light could make it through the crystaline roof even in perfect conditions to allow for plant growth. part of this is indeed the type of material the roof is made off, but also the rotation of the earth, and a few other minor factors. Although there are many materials that are translucent enough to allow light through, as L.Dutch explained these need to be polished to allow that to happen. even if you had the walls of the cave covered with nice reflective surfaces made of Gold or Silver, each metre that was reflective means that same metre cannot have life growing on it. and again each of those metres that do have life means less and less life is growing as there is less light bouncing around. As WillK suggested, Ice is a potential option and doesn't need to be polished. however... this still has the same issue with any surface allowing reflection means a surface not housing life, and even then, as far as i'm aware, a wall of ice (insert random game of thrones reference) is not really suitable base for growing life. Ignoring fish for a minute... there are plenty of examples of life at the depths of the oceans, and corals that don't need light to live. Many of these live around hydro-thermal vents, and they get their energy needs from converting the abundance of nutrients and minerals around them, this process is called chemosynthesis, this happens at a bacterial level and then other plants and corals live off those bacteria. Mix this with Fungi that don't photosynthesize but live off their environment, which could include living off the chemosynthesizing life... and you have most of a proper life cycle right there. Then of course there is the very theorectical Thermosynthesis, although this has never been seen before in real life. I am afraid not. While it can happen that some naturally occurring materials are transparent (think gems), to have reflection you need to have both the right material AND the right surface condition, meaning a polished surface. While some metals can be worked to make a pretty decent mirror, they never naturally come in nicely polished surface state. They shine, but don't reflect like a mirror. 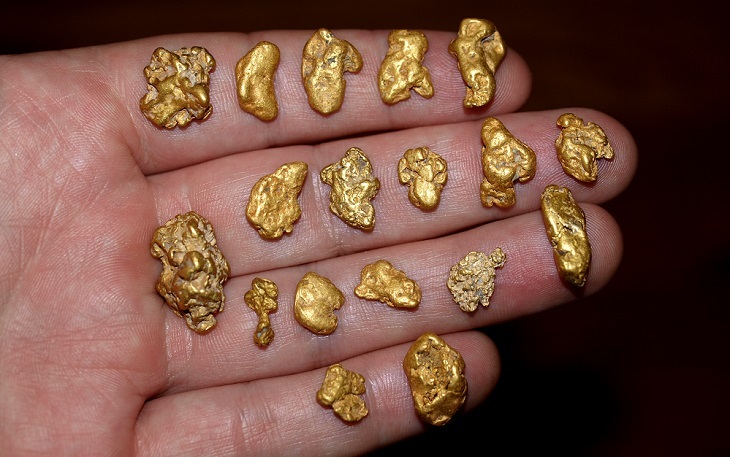 Think of gold or silver nuggets, since they are the only two naturally occurring metals. I think your best bet is a quartz cavern that has collapsed. Not the answer you're looking for? 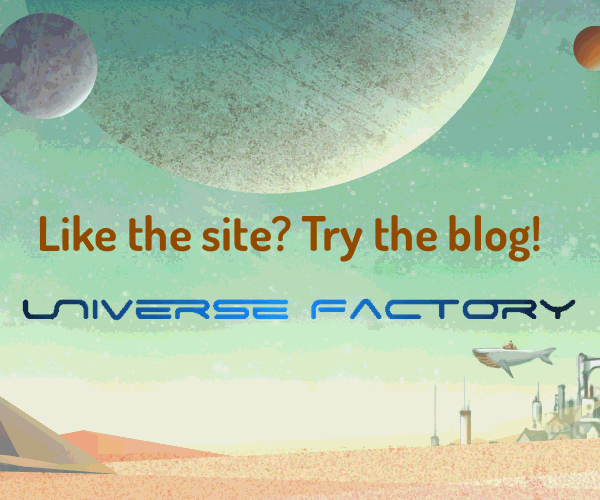 Browse other questions tagged environment flora or ask your own question. Could a plant-like forest or jungle form in an underground lava dependent ecosystem? What ecosystems and possible sentient creatures would form in subterranean pockets? What would happen if a volcanic cave was connected by a tunnel to a frozen cave?